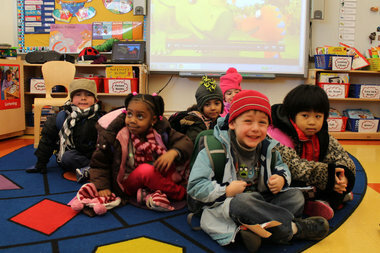 Pre-K children attend class at P.S. 303 in Queens. MANHATTAN — It's not too late for parents to enroll their 4-year-olds in free full day pre-K programs at public schools or nonprofits for this school year. The de Blasio administration — whose ambitious pre-K expansion aims to draw 53,000 kids this year — is letting centers continue enrolling kids past the traditional Oct. 1 deadline because there are still scores of open seats. "There are still opportunities for families to enroll their kids in free high-quality programs," said Rick Fromberg, senior advisor for the city's "Pre-K for All" program. He suggested interested parents call 311 and ask to connect with an enrollment specialist to find out about available spots. "It's a fluid system as parents are making choices and finalizing where they're going to putting their kids in pre-K," Fromberg continued. "The goal for us is to continue to enroll as many kids as we possibly can." Though city officials did not set a new enrollment deadline, they anticipate families will have several more weeks to sign kids up, Fromberg said. As of Wednesday, at least 16 public schools and 33 nonprofits across the five boroughs had vacant seats, according to a list compiled by the city of programs that were actively recruiting students. The numbers, however, are constantly evolving as parents move their kids from program to program as new seats become available elsewhere, Fromberg said. The city declined to say how many seats remained empty in all. The Department of Education's borough enrollment officers are currently sorting applications to account for students who switched schools and determine which pre-K programs still have open spots, Fromberg said. "We think the extension is a prudent decision given that this is the first year of this large expansion, and we want to ensure that every family has the opportunity to enroll their child in a program that fits their family's needs," said Gregory Brender, a policy director at United Neighborhood Houses, an umbrella group for the city's settlement houses, many of which offer pre-K programs. One program that has struggled to fill its seats is the Henry Street Settlement's daycare center at 301 Henry St. on the Lower East Side. It still has 17 openings out of 38 seats — almost an entire empty class — and is working hard at recruiting families, said Greg Rideout, who works in youth services at the settlement. The program was not on the city's most recent list of available seats. "We have been full the last few years," Rideout said. "But there are a lot of UPK classrooms in area elementary schools [this year], and parents want their children to go there to get acclimated to the school." He was hopeful the seats would fill "slowly but surely" since parents were coming in daily. It was unclear what would happen if Henry Street couldn't fill its seats, Rideout said. In the past, state funding was determined by a school's enrollment numbers as of Oct. 1. But things are fuzzier this year. Because pre-K across New York is being transformed and expanded, the state is revamping its enrollment and reimbursement process this fall, city officials explained. "We're working with the state to work that out," Fromberg said. The city is prepared to pony up funding, if necessary, to cover kids who enroll after Oct. 1, to ensure that as many pre-K programs as possible remain open, officials said. The city is already using about $750,000 of its own funding to open 75 seats in some programs that faced delays and were not able to open in time for the Oct. 1 deadline. The following public schools and community organizations had vacant pre-K seats as of Wednesday, Oct. 8, 2014, according to the DOE. The list is a moving target, as seats are opening up and filling quickly as parents move kids from program to program.